Bonthrone Security Services provide a range of CCTV systems for both domestic and commercial premises. Bonthrone Security Services pride themselves in the quality and intelligence of their CCTV systems. We will design, supply and install a system which we believe will exceed your expectations and meet any site requirements that have been discussed prior to installation including ANPR (Number Plate Recognition) and Auto Tracking features. We are specialists in designing structured IT networks to support the backbone of our CCTV systems, this means in some cases spanning distances of up to 10km wirelessly, where line of site is present. Our networks will not just carry CCTV data but also general network data meaning connection of PC’s and other IT equipment is possible as an added benefit in some cases. Bonthrone Security Services enjoy keeping up to date with the latest technology, using main brand equipment and partnering with major brands to ensure availability and competitive pricing of equipment. 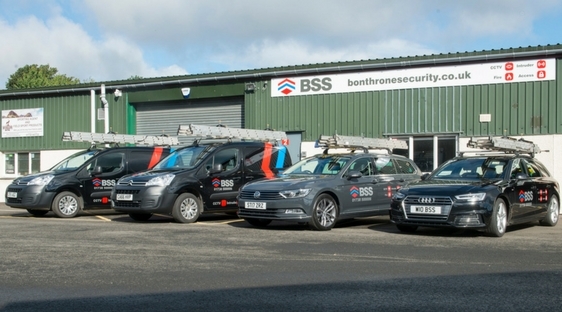 Bonthrone Security Services enjoy keeping up to date with the latest technology, using main brand equipment and partnering with major brands to ensure availability and competitive pricing of equipment. Bonthrone Security Services provides a range of high-end commercial CCTV systems for offices, retail, leisure, catering and workshop premises, ranging from a simple, one static camera system, to Pan-Tilt-Zoom (PTZ) multi-camera systems, with stand-alone monitors and digital recording/playback. CCTV systems can be linked to your televisions / PCs and tablet computers, providing total peace-of-mind. Bonthrone Security Services, based in Perth Scotland, provides a range of high-end commercial CCTV to monitor and protect your premises, whether it’s a small retail unit, or large multi-site commercial/manufacturing business. We offer a range of options, from a very simple single camera recording system to comprehensive multi-camera systems which you can access remotely. Our networked recording solution allows you to view, playback, change settings, take snapshots and other functions, remotely. You can view multiple sites, e.g. Head Office / Remote locations / Depots or Branches. This feature is provided via any internet connected computer, iPad, iPhone or Mac; whether it’s on your site or remotely located, clearly and simply. Covert systems are also available, where discreet monitoring of audio and video is required. BSS camera systems usually incorporate infra-red night vision cameras, as standard, to ensure that your business is safe, even during the hours of darkness. We always provide equipment with a minimum 12-month warranty, from the date of installation. We understand that price is an important factor. We’ll work with you to ensure that the system we provide delivers value. Importantly, we’ll make sure that the system we provide is of good quality so that you can have peace of mind it’ll stand the test of time. We’ll make sure that you’re fully satisfied, providing you with a system to protect your business and to suit your specific business needs and budget. We understand the investment that you’ve made in your business. We believe in spending that little bit of extra time during installation, to save time and cost in the future. This ensures that when we hand your system over to you, it will be trouble and error free. You should only ever see us when we return for periodic maintenance visits. BSS offers full comprehensive or basic, annual preventative maintenance packages on all systems. If the system was not initially installed by us, we will thoroughly inspect the system during a previously arranged take over maintenance visit to ensure it is brought up to an acceptable standard. We provide a full, 24-hour service, 365 days per year, with no fuss attendance, as and when required. We can arrange key holder/emergency service response active 24/7, to safeguard you and your property(s) through various signalling methods. The various options for connectivity of your CCTV system are detailed in our Intruder Alarm Systems section using our ARC (Alarm Receiving Centre). We believe in working to suit the customer’s needs. We will always contact you, prior to visiting, to arrange a mutually convenient time and date for any required maintenance work. We will always recommend and install equipment which we have experience of using, and is reliable. We can supply and install ANPR (Automatic Number Plate Recognition) Pan Tilt Zoom (PTZ) cameras with auto-tracking and PTZ cameras with perimeter detection to trigger alarms and/or preset locations. We also supply fully networked DVR (Digital Video Recorders), to allow remote dial in from iPad iPhone, Android, PC or Mac; enabling full camera control, playback and menu access from anywhere in the world which has an internet connection. This allows you to monitor all your sites, e.g. Head Office, Remote Sites, Depots and Branches, from one central location. Bonthrone Security Services provide a range of home CCTV system options, ranging from a simple, one static camera system, to Pan-Tilt-Zoom (PTZ) multi-camera systems, with stand-alone monitors and digital recording / playback. CCTV systems can be linked to your televisions / PCs and tablet computers, providing total peace-of-mind. Bonthrone Security Services, based in Perth Scotland, provides a range of domestic CCTV to monitor and protect your home. We offer a range of options, from a very simple recording system to comprehensive multi-camera systems which you can access remotely. Our networked recording solution allows you to view, playback, change settings, take snapshots and other functions, remotely via any off or on site computer/laptop or Mac, clearly and easily. Covert systems are also available, where discreet monitoring of audio and video is required. BSS camera systems usually incorporate infra-red night vision cameras, as standard, to ensure that your home is safe, even during the hours of darkness. We’ll make sure that you’re fully satisfied, providing you with the system to suit your specific needs and budget. We understand how important your home is to you and believe in spending that little bit of extra time during installation, to save time in the future. This ensures that when we hand your system over to you, it will be trouble and error free. You should only ever see us when we return for periodic maintenance visits. BSS is automatically notified if any monitored system develops a fault. We’d then contact you to get the issue resolved, quickly and effectively. We also receive a daily report detailing any system activations, enabling us to be proactive, saving you hassle and inconvenience. We can supply and install ANPR (Automatic Number Plate Recognition) Pan Tilt Zoom (PTZ) cameras with auto-tracking and PTZ cameras with perimeter detection to trigger alarms and/or preset locations. We also supply fully networked DVR (Digital Video Recorders), to allow remote dial in from iPad iPhone, Android, PC or Mac; enabling full camera control, playback and menu access from anywhere in the world which has an internet connection.